I have had it on my mind to make these maple pecan cookies for a while now and I finally got around to it. These maple pecan cookies came out really tasty! Maple and pecans are two of my favorite things, so why not throw them together and make a maple and pecan thumbprint cookie. These are made with whole grains and no refined sugar. I also added extra crushed vanilla bean and cinnamon to make the cookie appear sweeter than it actually is. Did you know that spices can do that? I was pretty surprised to first read that, but now I swear by those vanilla beans. They are amazing! This is a great recipe to do with your kids as well. Since my daughter is only 3 1/2, her job is to push the pecans into the middle of the cookie. I used raw pecans for my recipe, but they would be equally delicious with my Candied Pecans as well. Add the pecans to a bowl with the rest of the dry ingredients. Add all the wet ingredients into another bowl. Add dry to wet and mix only until combined. The dough will be a bit thick and sticky. Roll into balls and place on a lined baking sheet. Press the cookies down flat with the palm of your hand. 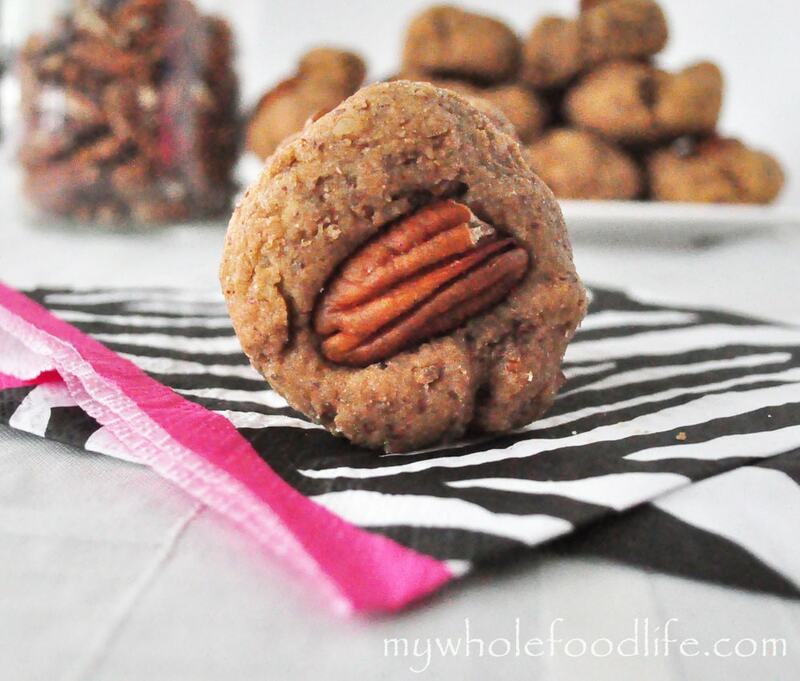 Press a pecan into the middle of each cookie. Bake in the oven for about 13 minutes. They should last at least a week, but you can refrigerate or even freeze to make them last longer. Enjoy! i definitely need to make these! they look delicious! I always clean my fruits and veggies. I haven't done my nuts yet, but I have thought about it. I just had a reader tell me today that they tried to make my peanut butter recipe with soaked nuts and it didn't work. If I soak my nuts, am I going to be able to use them in all recipes? I get mine crispy in the oven while drying...maybe freezing them changes them..maybe if you just clean what you need and skip freezing..If the reader said it didn't work then that's something to think about..but I make almond butter in my emulsifier with cleaned and frozen almonds and it comes out great..trial and error..anyway I think you are doing a fantastic job...gypsy..
Maybe. I will tell her to get them crispy. Been hopping blog over blog to look a perfect recipe for cookies and I must say this is one of the best. You're welcome! Glad you liked them. Can I make these gluten free by substituting coconut flour, chick pea flour or fine almond meal flour or a combo of these? Do u think it would be an equal switch using same quantity in original recipe? Thanks for your help. I would not be ab equal switch. If you use coconut flour, you will need to add lots of eggs. The general rule 1 egg for every 1/4 cup flour. Thanks for ur quick response! So I would need more eggs with any alternative flour or just the coconut flour? I make the flax seed eggs as my daughter cant have eggs or practically anything right now, her immune system is reacting to so many different foods. Maybe I can mix all 3 flours to equal the amount in the recipe and use the applesauce and one egg replacer as it is written and then add in just another 2 flax eggs, think that might work? I think these would b so good and my daughter would love them and not b so sad about ask the food restrictions on her 3 month clean diet for her. We're hoping after 3 months her blood tests week show a better profile and she'll get to add back at least a few of the food items she can't have currently. More eggs with coconut flour. For another grain free flour, you will probably still need a couple extra eggs, but not as many eggs as coconut flour would require. Melissa your recipes are so enticing and being a vegan I am certainly enjoying those I have made. I plan to introduce some and also your book at a community health fair I am planning for April 2015. I really enjoyed the subtle maple flavor and the fact that cookies weren't overly sweet, but I found them to be a bit on the dry side. This is my first time making and eating a vegan cookie so I'm not sure if that is typical. Thanks for sharing your recipe!